I’ve always loved a good crumble – it’s such a delicious thing to eat all year round, not to mention how simple it is to make! Traditional crumbles are a tad on the unhealthy side – loaded with flour, sugar and butter (yuk, yuk and double yuk) but luckily it’s just as easy to make one just as yummy without any gluten, dairy or refined sugar. 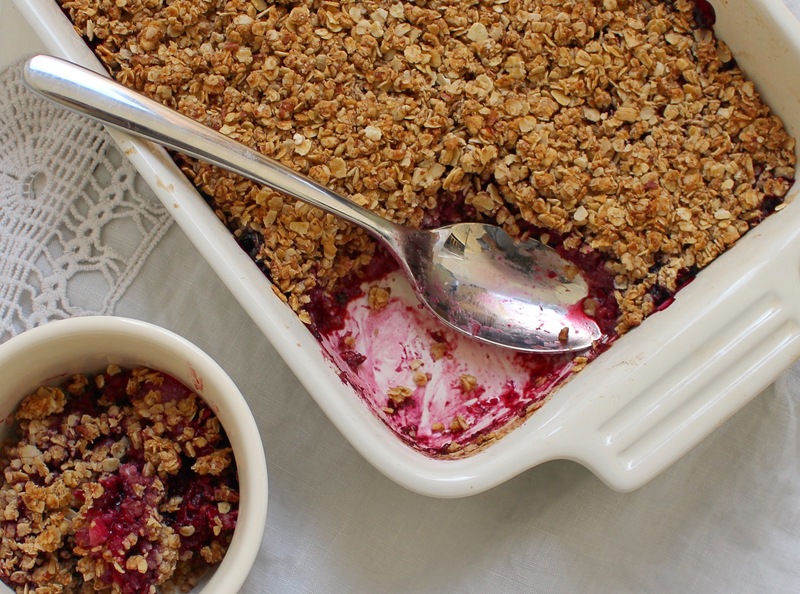 This crumble is one of my fave dinner party desserts, as you can prepare it in advance and then all you need to do is pop it in the oven while you’re eating your main course – totally stress free! Plus, if there’s any leftovers it makes for an amazing guilty-free breakfast the next day! Although sadly there’s never normally very much left, but I guess that’s a testament to its tastiness! Another great thing about this dessert (or breakfast!) is that it only uses six ingredients, and if like me you already have maple syrup, coconut oil and cinnamon in your store cupboard you hardly need to buy any ingredients, so it’s good on the old purse strings too! Now let me quickly tell you about how secretly healthy this crumble is – the berries are low in sugar and packed with antioxidants and vitamins, and buying them frozen means a lot of the goodness has been locked in. You can find them in most supermarkets in the frozen aisle and they’re a great inexpensive alternative to buying fresh berries, plus no need to eat them quickly as they’ll last for ages in the freezer. Oats are full of fibre and slow release energy, coconut oil is packed with good fats and cinnamon is great for regulating blood sugar. What’s not to like! Pop the berries in a saucepan with a tablespoon of maple syrup and cook on a low heat for about ten minutes until all the fruit is lovely and soft. To make the crumble topping, blitz the pecans in a food processor for about a minute until they form a flour, then mix them in a bowl with the oats. Melt the coconut oil in a saucepan and stir in the maple syrup and cinnamon. Pour the melted mixture over the oats and pecans and stir well. Pour the berries into a medium-sized baking dish and cover evenly with the topping. Bake at 180 degrees for 25-30 minutes or until it is golden brown on top.